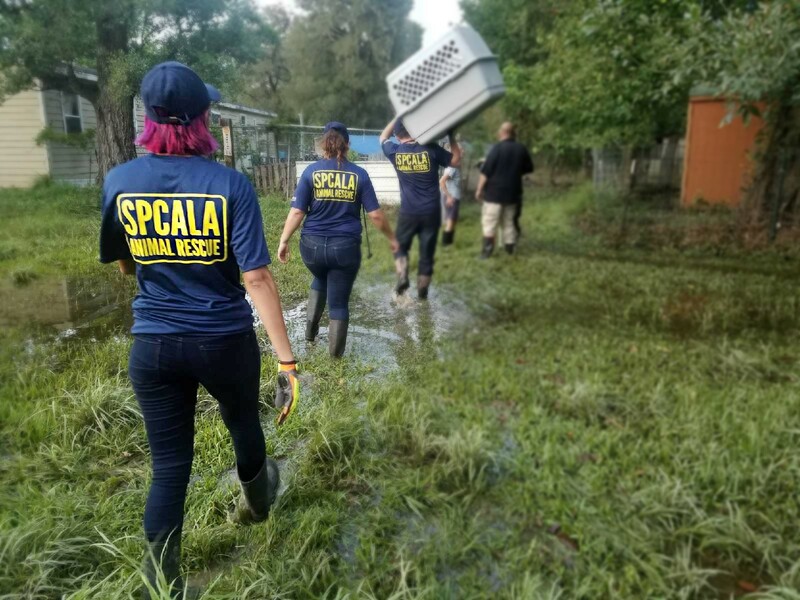 For the third day, members of Society for the Prevention of Cruelty to Animals Los Angeles’ (spcaLA) Disaster Animal Response Team (DART)™ are in Houston assisting with Hurricane Harvey response efforts. Since early Sunday morning, DART members have cared for hundreds of animals displaced by the storm. Animals are being transported to multiple locations in the area. These animals need food, water, veterinary care, a place to rest and recover, and TLC. Crpl. Wilson reported that early this morning “the team was loading supplies for distribution centers in Manvele and Sealy, Texas.” He went on to say that each van carried “approximately 4,000 pounds of food, plus toys, bedding, litter, cleaning supplies, and the like.” Then, the team returned to a boarding facility in Magnolia, TX. where they are assisting with checking-in of approximately 120 dogs who had been transported from Beaumont, TX. The check-in process includes bloodwork, medications, vaccinations, flea control, disease recognition, and physical exams. The effects of Harvey are devastating, and recovery efforts will last for months. spcaLA will send rotating teams of DART members to Houston to prevent fatigue but also ensure that members are available in Los Angeles for fire-related response, if necessary. “We are so thankful to spcaLA donors,” said spcaLA President, “It is their support that provides the vehicles, equipment, supplies, training, and staffing necessary to maintain spcaLA’s elite response team. To donate to spcaLA’s Hurricane Harvey and other disaster response efforts, please visit spcaLA.com.